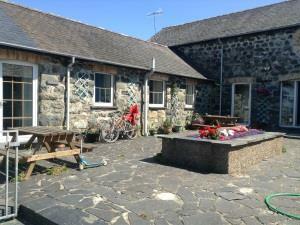 Plas Y Nant01341 250350work Self-cateringSHORT BREAKS AVAILABLE OUT OF SEASON - PLEASE CONTACT OWNER DIRECT. Perfectly situated between the coast and mountains these stone cottages provide a relaxing base for your holiday. Guests return to see spectacular sunsets, pedigree Welsh Black cattle and mountain sheep grazing the hills. Participitation in Tir Gofal has provided areas of conservational interest. SHORT BREAKS AVAILABLE OUT OF SEASON - PLEASE CONTACT OWNER DIRECT. 10 minutes walk to beach through farm land. Fairbourne sandy beach - 3 miles. There are excellent cycle trails in the area: Coed y Brenin Trail and the Mawddach Path that extends from Barmouth to Dolgellau. We have secure premises for guests' own bicycles. A communal utility room and information area. Children welcome from any age. Situated on the Cardigan Bay Coast between Dolgellau and Tywyn, (A493). Property on the south side of Llwyngwril. From the direction of Tywyn turn left at 30 mph sign on entering the village.